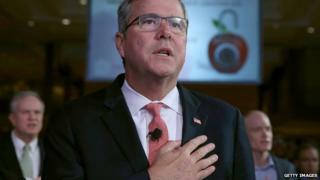 US presidential hopeful Jeb Bush has edited a trove of emails he released, after it emerged they contained correspondents' personal details. Social security numbers, email addresses and phone numbers were all included in plain text in the files. Mr Bush released the emails from his eight years as Florida's governor, in the interests of transparency. Earlier this week, his technology chief, Ethan Czahor, resigned over "inappropriate comments" he had made. In one email, sent in 2004, the name, social security number and other details belonging to the mother of a sick child appeared. The information had been in a note written by a healthcare representative, the Verge reported. Other emails also contained social security numbers and other personal information. The cache, which had been posted on Tuesday, included hundreds of thousands of emails from 1999 to 2007. Mr Bush's campaign team moved to redact as much of the information as possible after the leaks came to light. As of Wednesday afternoon, a message posted on the website hosting the emails said: "This page previously included raw .PST data files provided by the Florida Department of State. We were informed that some personal information was available in the raw data so we removed these files. "Please contact the Florida Department of State with any questions or public records request. You may still read these emails on the email calendar link, where we have redacted personal information we have been able to locate." The news came after Mr Czahor resigned over comments made by him on Twitter and attributed to him on another website. Mr Czahor, who was hired to Mr Bush's Right to Rise political action committee in January this year, had posted messages on his personal Twitter account in which he referred to women as "sluts" and made remarks about gay men. He also made racially offensive comments on the other website. Mr Bush's spokeswoman Kristy Campbell noted that Mr Czahor had apologised for "regrettable and insensitive comments" that did not reflect the views of Mr Bush or his organisation. But she added that it was "appropriate for him to step aside". Mr Czahor apologised after the Twitter comments emerged, but did not resign until the publication of those found on his website by the Huffington Post. He tweeted that he hoped his "recent news won't dissuade future techies from entering politics, regardless of political affiliations/backgrounds". Can Jeb Bush avoid Mitt Romney's fate?